The new Biotec Screenmatic enables safer and easier removal of coarse substances from the pond. The solids are withdrawn from the filter system via an extractor sieve and are transported into a collection tank through a permanent cleaning process. This can be easily removed. The Screenmatic drive cleans the sieve continuously and guarantees sustainable flow. 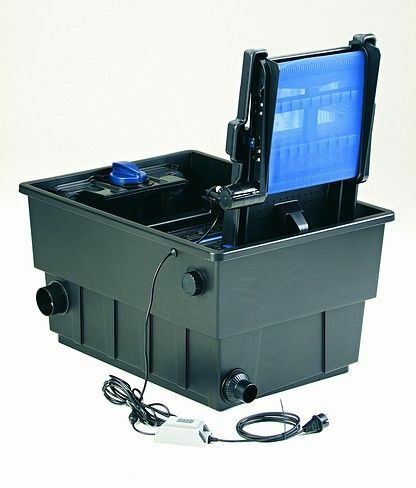 The Biotec 30 has been designed for large ponds, and particularly for ponds with koi stock. of large quantities of nutrients. Thus, OASE has again been successful with yet another biological innovation. The Biotec 30 multi-zone filter has a new type of filter mat with varying thicknesses, in addition to the brush chamber. to do their work care-fully and effectively. Biotec 30 has been tested for ponds up to 130,000 litres. Connection with the Bitron 15 to 110 clarifiers and the Aquamax pump range needs no additional parts. 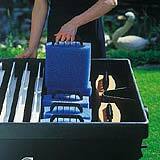 Suitable for decorative ponds max.